Hop on Over and Join Us to Celebrate EASTER Like No Bunny Else…. HUNT TO BEGIN PROMPTLY AT: 2:00 p.m. Following the Easter Egg Hunt, an assortment of refreshments will be served in the Maple Lane Community Room. 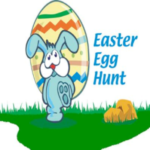 Our EASTER EGGSTRAVAGANZA will include prizes for each of the participants. At the conclusion of the afternoon, all children attending will be eligible to sign up for our GRAND PRIZE: AN EGGCELLENT EASTER BASKET filled with lots of goodies! This entry was posted in News & Announcements on March 6, 2018 by pattyaccha@grics.net.